Jaycar sells this tuner, and I wouldn't be surprised if a few other places sell the same thing with a different name badge, it's obviously one of those generic kit products (like masses of DVD players are). I've avoided digital radios as something I didn't need, nor want, until one of the radio shows I wanted to listen to was moved off the analogue broadcast stations, and only broadcast on a digital transmission, or on-line. Listening on-line wasn't a viable solution (can't do that when I don't have the internet handy, and it's a drain on your download allowance), and is seriously annoying for at least a couple of other reasons (the internet stream was running on an interstate timezone, so advertised times are wrong, and you have to put up with the stutters and glitches when something else on the computer interrupts the stream). Looking around for a digital receiver, to see what's available, there's a variety of over-priced small standalone radios with only one small speaker and a headphone jack, and nothing suitable for connecting up to a HiFi stereo system, unless you pay several hundred dollars, until I found this model on demo at Jaycar. I had a brief twiddle with it the store (luckily it was connected up, so I could listen to a working model), and decided it was probably worth taking the plunge. It can be operated from the front panel, without needing the remote (unless you'd turned the volume down using the remote, or had switched between analogue FM or DAB+ modes). The only front-panel controls are a power/stand-by switch, and a station selection knob (you spin it to scroll through the available stations, then press it to tune into the displayed choice). I'm seriously tired of audio video equipment that can be rendered useless by the loss of the remote, and having to have a plethora of remotes nearby to operate equipment. On the plus side, the remote is a decent sized thing, and seems nicely responsive to the buttons, unlike various modern remote-controlled things, that have really crappy remotes (that have to be aimed with precision, don't work well over a distance, have teeny-tiny buttons, et cetera). 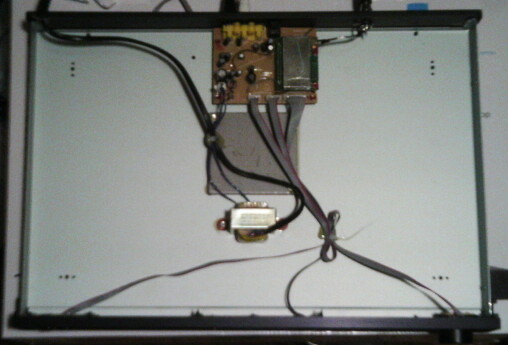 The back panel has an F-connector for the antenna, and comes with a basic single-wire antenna that can be screwed into this socket. There's a pair of RCA sockets for analogue stereo out, another RCA for digital audio signal out, and an optical output. I can only make use of the analogue audio, so I have no idea how well the other two work. Sound quality is reasonable, for speech, but our broadcasts are compressing the hell out of the digital data to squeeze several channels into one RF carrier. At times, it sounds like you're playing a 1970s compact audio cassette, where parts of it have been crumpled. From time to time, treble tails off, you get an audio-compressor type of effect, and that peculiar sound you get from short-wave as atmospheric effects change the reception path (almost like audio-phasing). I haven't had a chance to listen to all the channels, but the ones I wanted to had those problems, periodically. By way of comparison, flipping between ABC classical FM and the DAB simulcast, the FM was much better to listen to. Sadly, DAB+ would seem to be the new crummy AM replacement, rather than something even better than FM. Taking the cover off, and having a look inside, you really have to ask, "This is worth $169? (March 2015, pricing.) It's an almost empty box, with a few tiny circuit boards, and almost no components. I think this should really be selling for $100 less than it is, at least. Looking at the generic basic parts, and very basic case, it's not what you'd call a high quality product. And the low component count doesn't justify a high price, either. While I expected a fair amount of empty space, since the unit is designed to fit in with traditional stereo equipment (it's 43 cm by 30 cm by 6 cm), so it will have an over-sized box, I was still surprised. Knowing that these kind of devices don't actually need a lot of electronics to do what they do (no tuner does, well not the typical domestic radio broadcast receiver), didn't really prepare me for what I found. It has a couple of metal plates bolted into the centre, to weight the unit down somewhat. While that has the feeling of a being a con job, it is necessary to increase the weight of appliances like this, so they don't slide off the desk when you press buttons on the front panel. And is something that quite a few other too-lightweight devices really need doing to them. It has a mains cable floating about the insides that was supposedly glued down in place, but the glue has not held. Really, this should be properly tied down with something that's properly fastened to the chassis. One thing in its favour is that it doesn't use a switch-mode power supply. They're electrically noisy, and not very reliable.